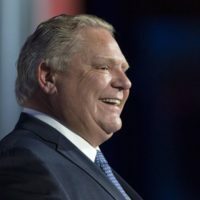 Apr 16 2019 — Robert Benzie — Toronto Star — Premier Doug Ford’s government has fired the opening salvo in its advertising blitz against Ottawa’s controversial new carbon-pricing scheme. As first disclosed by the Star, Queen’s Park is launching a taxpayer-funded campaign on television and radio, in print and on social media targeting Prime Minister Justin Trudeau’s plan. 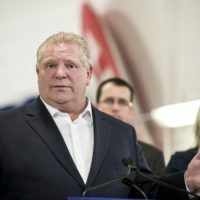 Apr 8 2019 — Robert Benzie — Toronto Star — Following the lead of U.S. President Donald Trump, Ontario Premier Doug Ford is attacking the media for criticizing his policies. 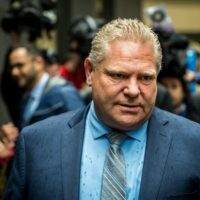 In an email fundraising blast sent Monday by the Progressive Conservatives, Ford charges that unnamed journalists and news organizations are unfairly targetting him for opposing the federal carbon-pricing measures. 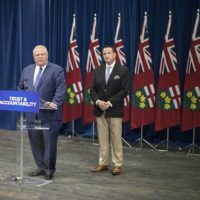 Mar 20 2019 — Robert Benzie — Toronto Star — Premier Doug Ford is threatening to call the Ontario Provincial Police to probe the fundraising practices of the opposition New Democrats. 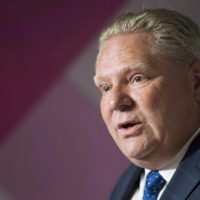 With NDP pouncing on ousted Progressive Conservative MPP Randy Hillier’s allegations about how the Tory government conducts business, Ford lashed out Wednesday. Mar 4 2019 — Robert Benzie — Toronto Star — The Progressive Conservative association in ousted MPP Randy Hillier’s riding wants Premier Doug Ford to let the veteran member back into the governing party’s caucus. 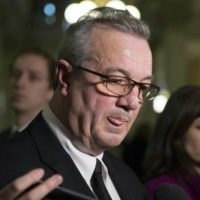 With Tory MPPs expected to discuss readmitting Hillier to caucus on Tuesday, there is mounting pressure on Ford to bring him back into the fold. 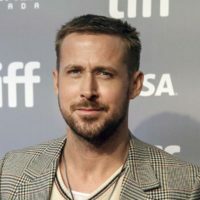 Jan 29 2019 — Robert Benzie — Toronto Star — The Progressive Conservatives are banking that lapsed supporters of the party will not want to break up with Ontario-born heartthrob Ryan Gosling. Embedded in the party’s latest fundraising appeal is a GIF of the actor from the 2013 movie Gangster Squad. Jan 25 2019 — Robert Benzie — Toronto Star — Premier Doug Ford has hired the Toronto Sun’s top editorial executive to be his deputy chief of staff. The appointment of James Wallace, the vice president of editorial for the Sun tabloids, was disclosed to Progressive Conservative staffers on Friday. 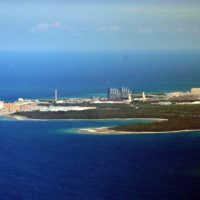 Jan 25 2019 — Robert Benzie — Toronto Star — The Ontario government says $200 million in efficiencies found during the refurbishment of the Bruce power station, the world’s second largest nuclear facility, will be passed back to ratepayers. Privately owned Bruce is spending $13 billion to overhaul six of the eight reactors at the massive Lake Huron plant. Jan 23 2019 — Robert Benzie — Toronto Star — This time last year he was Ontario’s next premier. 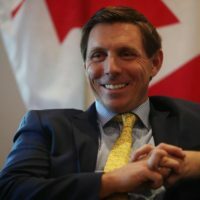 Today, Patrick Brown is the mayor of Brampton. It was Jan. 24, 2018, when CTV News broadcast an investigative story alleging Brown, then the Progressive Conservative leader and front-runner to succeed Liberal premier Kathleen Wynne, was sexually inappropriate with two women. 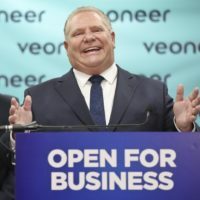 Jan 15 2019 — Robert Benzie — Toronto Star — Premier Doug Ford’s governing Progressive Conservatives are revving up their money machine. 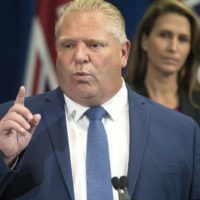 After loosening campaign finance laws introduced by former premier Kathleen Wynne following a 2016 Star exposé of Liberal fundraising, the Tories are banking on a cash windfall. Jan 11 2019 — Robert Benzie — Toronto Star — Premier Doug Ford is losing his most experienced political aide. 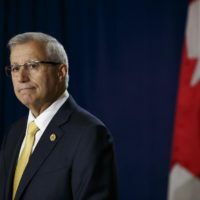 As first disclosed by the Star, Jenni Byrne, the premier’s principal secretary and a key architect of the Progressive Conservatives’ majority election victory last June, is leaving his office for a new post at the Ontario Energy Board. Jan 8 2019 — Robert Benzie — Toronto Star — The first political fundraiser since the Progressive Conservative government loosened campaign finance rules is a decidedly modest affair. 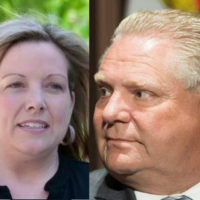 Premier Doug Ford will attend a $25-a-plate spaghetti supper in Kitchener-Waterloo on Friday night.